This is the first conference dedicated to young professionals driving change in the clean energy sector. emPOWER is a non-traditional conference bringing together clean energy professionals and organizations across the public, private, and non-profit sectors. 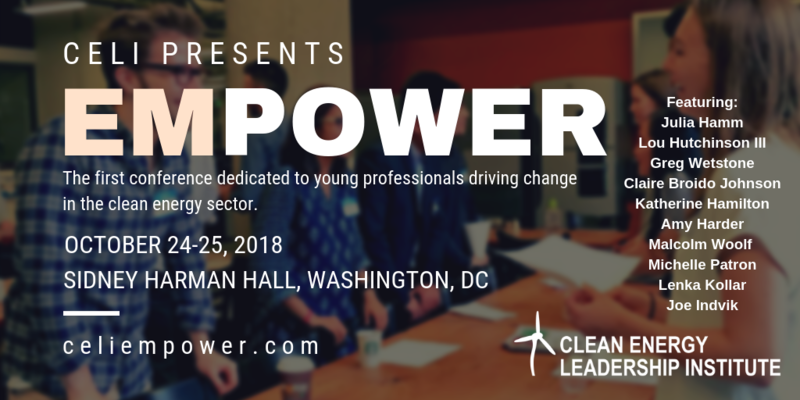 In convening some of the most prominent voices in clean energy leadership, the sessions and workshops at emPOWER will focus on the development and enablement of a diverse, inclusive, and passionate community of leaders to advance innovative clean energy solutions. Attendees should prepare to feel challenged, inspired, and motivated to tackle the multifaceted issues in a changing energy landscape. Registration details are available here. Based in Washington, DC and San Francisco, CA, the Clean Energy Leadership Institute (CELI) is a 501(c)(3) nonprofit dedicated to developing and connecting the next generation of diverse clean energy leaders. Our signature Fellowship Program provides early-career professionals with interdisciplinary educational training, leadership development, and a supportive professional community.